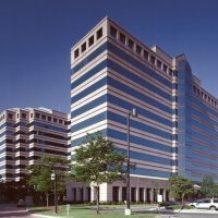 The Executive Offices at Fairlane Plaza are beautifully finished individual offices in a suite with a shared lobby, kitchen, and two conference rooms. All offices have windows and real wood furniture. Building amenities include covered parking, a café, on-site property management and 24-hour on-site security. A courtyard connects the building to The Henry – a Marriot Autograph Collection hotel.